When you steal a culture’s art, you steal their soul. When you vandalize their art, their ritual objects, you attack an entire people. This is not a happy story. It is certainly not an expected story. It is the story of the Jews of Windhoek, Namibia, Africa. There are 30 families, at most. There are barely any children. My daughter, Hannah, just became the most eligible woman of marriageable age among the Jews here. I know because someone tonight made a point of mentioning it. She is moving here to attend university. But that is not the story. The story is about a small congregation that was defiled twice in the last two months. Everything of value was stolen…. furniture, catering equipment, books, dishes, prayer books. The last robbery occurred last Shabbat –the sabbath marked from sundown Friday to an hour after sundown Saturday. The lights are on a timer, because observant Jews do not turn on and off lights on the sabbath. It was after 11 pm, when the lights go off. Unable to switch on the lights, the robbers tore pages from prayer books and copies of sacred text, and set them ablaze to light their way. Then they used the Hanukkah menorah to pry open cabinets. It broke. Then they stole all the furniture they could, the dishes for meals, silver flatware, silver kiddush cups and other valuable ritual objects. Then they headed for the ark, where the Torah, the sacred texts are kept. Maybe they knew that the Torah scrolls have no market value. They left them alone. Then they tore the tzeddakah box (charity box) from the wall. How much could it have contained? $10? The cupboard that protected all the items for Passover, which may only be used then, was broken and ransacked. The shul is old….built in 1924. There are no funds to replace these things. Holiday celebrations as a community are ruined. There are so few people left, will they bother to go on? Staff hasn’t been paid in three years. They show up anyway. This is community. But it’s soul is shattered. Religious art is the oldest, most dear to us. When our places of worship are defiled, our souls are sullied. Still, tonight, in a 91-year-old shul, we celebrated the Sabbath… with four men and four women — not enough for a minyan, even if the women were counted, which we weren’t. Still, there was community. There was hope. There was joy. 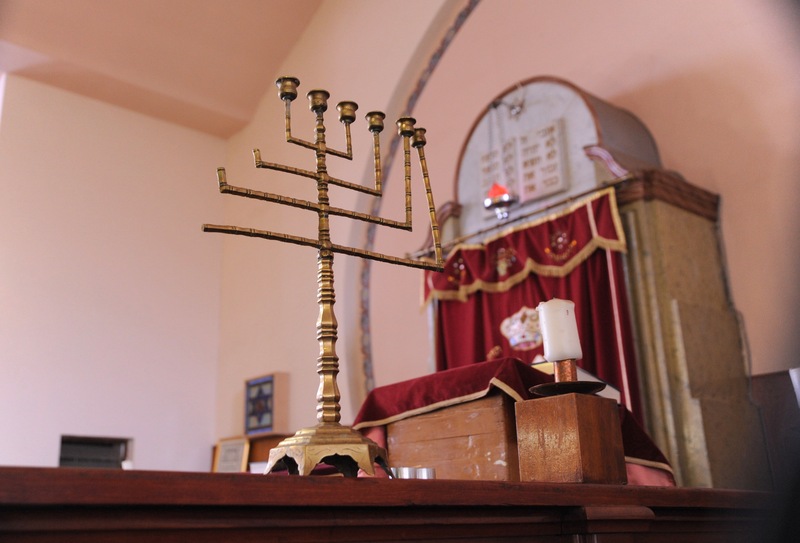 Damaged Hanukkah menorah in Windhoek shul. The ark is in the background. This entry was posted in Judaica, Travel and tagged AFrica, community, heritage, Jewish, Judaica, Judaism, Namibiia, Windhoek. Bookmark the permalink.